Cool, Innovative, Influential, Superstar. David Bowie. David Bowie has been a soundtrack in my life since 1972 with the album The Rise and Fall of Ziggy Stardust and the Spiders from Mars. His energy, theatricality, his music period always moved me. You never knew what Bowie would do next. He was the master of transforming his persona in ways one couldn’t image. Bowie’s music embraced and changed the concept of Rock n Roll with his reinvention, musical innovation and visual presentation. I loved everything Bowie created and the song “Changes” particularly resonated with me since I believe it was a song about youth, growing older and understanding. Bowie had just released his 25th studio album, “Blackstar,” last Friday. It has already received strong reviews. 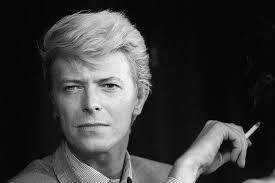 The song “Lazarus” was a poignant parting gift for his fans and reflects his feelings about death. Another soul lost to cancer. Now singing in the heavenly choir.